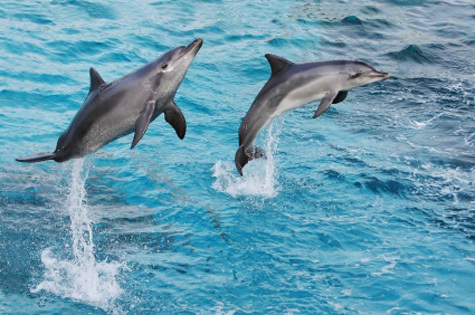 Florida bottlenose dolphins are beautiful, intelligent and athletic. Those of us who are down on the Treasure Island Beaches early each morning usually get to see a daily show from the small dolphin families that feed there. I normally see them between the hours of 7:30am - 9:00am along our Gulf Beaches here, west of St Petersburg FL. These Florida bottlenose dolphins are usually gray in color or brownish-gray. They look close to 5 feet in length and play in groups of three or four. They are easy to spot because the morning sun reflects so highly off their skin. Once you see it, you'll be able to recognize that sheen for life. Mostly, they undulate through the waves and flip water with their tails, but when they decide to leap out of the water, you are amazed at how muscular they look. * Dolphins are mammals. They are not a fish. They nurse their young. * Bottlenose dolphins can grow to 8 feet in length. * They will weigh between 430-600 lbs. 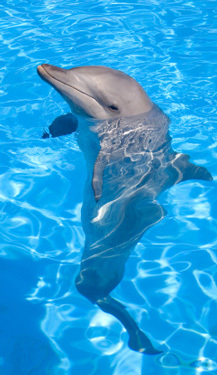 * Bottlenose dolphins eat between 15-30 lbs of fish and sealife each day. * Dolphins normally have just one calf about every two to three years. * There have been recorded instances of twin calves. * Calving season here on the Gulf Beaches usually peaks in May. * A dolphin calf will suckle from the mother for 1-1/2 to 2 years. * They will swim with their mothers for another 3-8 years. * Dolphin calves are born in shallow water, either tail or head first. * The little guys are about 3-1/2 to 4 ft long and weigh a little over 40 lbs. * Sometimes, there is an assisting dolphin near. It can be a male or female. 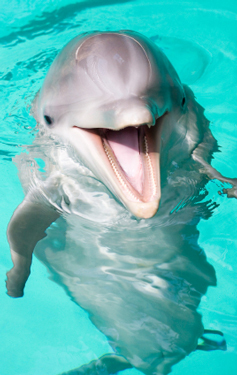 * Dolphins communicate with a variety of sounds like clicks, moans, whistles, and squeaks...but not through their mouth. * Dolphins make all of these different noises through their "blowhole" in the top of their head. * Dolphins can whistle so sharp and shrilly that they can stun fish. * Florida bottlenose dolphins search for food through a use of sonar called, "ecolocation." They send out clicks, and echos come back. * Bottlenose dolphins have excellent eyesight. They can easily distinguish a friend or foe. * Bull sharks, here on the Florida Gulf Beaches are a predator of bottlenose dolphins, but a group of dolphins can outswim one and fatally hurt it by butting it collectively. * The worst foe to bottlenose dolphins is man...not sharks. Each year, hundreds of dolphins get tangled in fishing nets and crab pot lines, and end up drowning. The most famous occurrence of this nature involved Winter the dolphin who lost her tail and was fitted with a prosthetic one at the Clearwater Aquarium. These are just a few dolphin facts for you. There are many fascinating others. Dolphins are normally friendly, but that doesn't mean they'll let you swim with them. There have been lots of times I've seen them out in the Gulf, and tried to swim out to them, but they always take off. Maybe you'll have better luck.